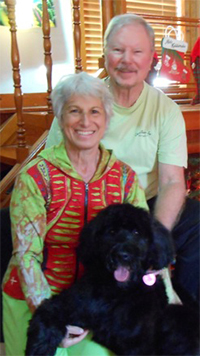 Mary lives with her husband Jim, and Max, their Portuguese Water Dog. Their blended family includes five adult children and nine grandchildren. Mary has lived in Austin since 1979. Mary has been interested in (and practiced) alternative health care for more than 30 years. Her passion is helping people (who are actively looking for some change in their lives), reach optimal health; not just doing well for their age, but rather having the energy and vibrancy of someone much younger (in body, mind and spirit). From teaching nutrition classes to high school seniors, to presenting adult workshops on the benefits of essential oils , Mary has been sharing her extensive knowledge base of alternative wellness with family and friends for years. She keeps up with all of the latest research on alternative health care, spending a minimum of two hours per day devoted to research and study. Mary’s professional career for 30 years was in Information Technology, with the last 18 years as Director of Instructional Technology at St. Edward’s University (retired in 2012). During that time Mary was introduced to Quantum Biofeedback which was a natural fit for her, merging her technology skills with the SCIO device and all of the modalities of alternative health care. Mary has studied Quantum Biofeedback with Adam Mandel, a world renowned integrative wellness educator and Master Practitioner. Adam served as the personal therapist to the crown families of Dubai, Bahrain, Qatar, and Saudi Arabia and most recently has worked with Olympic athletes (in addition to countless individuals seeking a healthier, more productive life). Mary studied many different biofeedback philosophies and methodologies during her certification process. With the SCIO, Mary finally had a tool that identified the stressors on the body and could now set to work putting the pieces of the puzzle together. Reaching optimum health ‘is’ a puzzle – the science and technology of the SCIO identifies the stressors, and then Mary looks for patterns among the stressors to intuitively hone in on the biofeedback programs which will best bring the body in to balance.